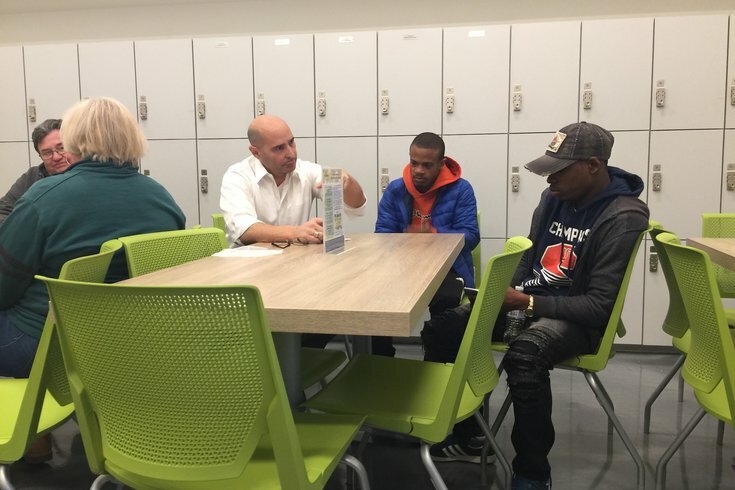 Philadelphia Common Pleas Court Judge Scott DiClaudio (middle, white shirt) talked about job prospects with a pair of men on hand to perform community service with him in March 2018. The judge finds himself warring with District Attorney Larry Krasner, whose office is the subject of a complaint filed by DiClaudio’s girlfriend. This is the story of a probation-friendly Philadelphia Court of Common Pleas judge whose girlfriend claims in a Human Relations Commission complaint that she was fired from the District Attorney’s Office two months ago because she’s white. Finally, this is a story in which questions were raised – hypothetically – about the impartiality of three defense attorneys who worked to get Krasner elected, and their effort to negotiate a “non-trial disposition” for the “Antifa mob” which allegedly attacked two U.S. Marines in Old City last November. Suffice it to say, Wednesday morning was an interesting time at the Criminal Justice Center as a Krasner subordinate saw the motion denied by DiClaudio, who treated the bench as if it were a pulpit. Paul George, assistant supervisor of the district attorney’s law department, immediately noted that the office would appeal the decision to Pennsylvania Superior Court. He also said any case heard in the meantime would be done under protest from the District Attorney’s Office. While it had been simmering before Wednesday, per the CJC’s rumor mill, the DiClaudio vs. Krasner battle formally kicked off on Monday. Marinating overnight with the thought that it was an act of revenge, DiClaudio grilled George on Tuesday, asking whether the DA’s office was arguing that he couldn’t be a fair arbiter of justice despite four years on the bench without such complaint. As that was happening, defendants showed up to court only to learn their hearings would not go off as scheduled. They would leave with subpoenas to return at a later date. 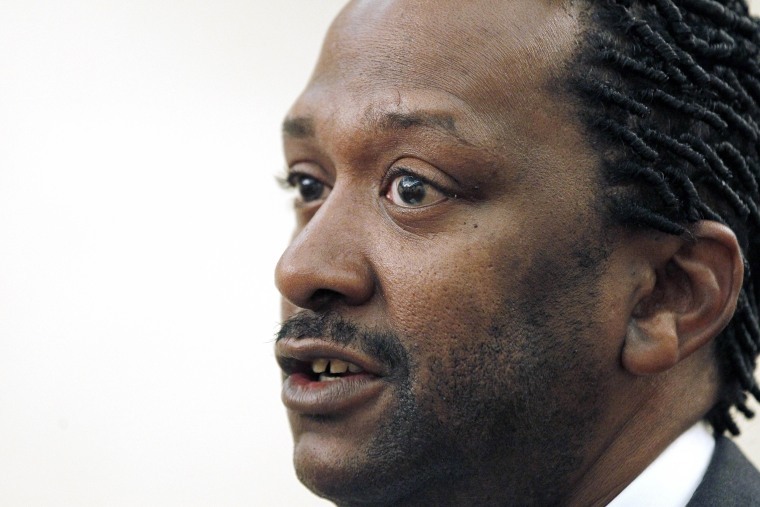 “The commonwealth says I can’t be fair enough to give you a date,” DiClaudio told one defense attorney before revising the recusal issue stemming from “an alleged conflict” around 9:10 a.m.
George maintained that an active discrimination complaint filed by the judge’s girlfriend – former Assistant District Attorney Catherine Smith – translated into the “appearance of impropriety” in cases heard by DiClaudio, who maintained he had nothing to do with that filing. 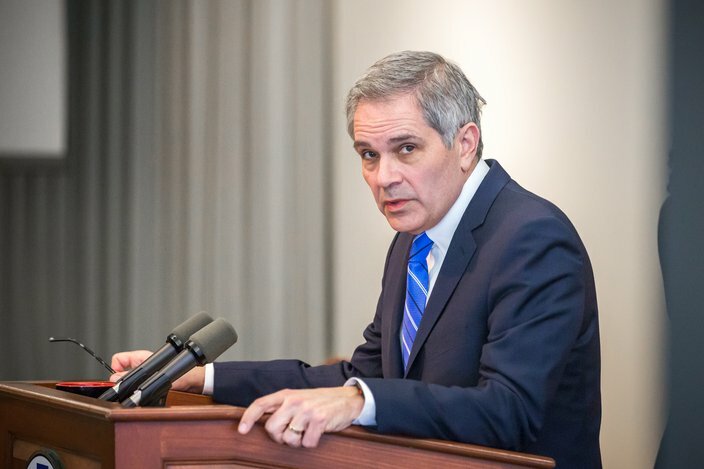 What ensued – before DiClaudio took up the cases on his Wednesday docket – was an airing of dirty laundry replete with confrontation and innuendo that made it feel as if Krasner was being tried in absentia. Among the issues that arose during the tense back-and-forth discussion were texts that DiClaudio sent to Anthony Voci – chief of the DA’s office’s homicide unit – asking whether he knew what was going on. As the commonwealth argued that the text qualified as “ex parte communication,” the judge threatened to have Voci called to his courtroom to testify under oath on Wednesday to vouch for it not having been that. “That’s so far from the truth it’s farcical,” an indignant DiClaudio said, not following through with sending Sheriff’s Office deputies to bring Voci to his courtroom. As George stood before the bench, DiClaudio explored the very nature of appearances of impropriety in city courts, specifically whether they existed in cases being handled by the law firms where Krasner once worked in a defense capacity before his election as district attorney. He referenced that Krasner had sued the Philadelphia Police Department and specific officers now being called to testify on behalf of the prosecution. “I wouldn’t be happy if I was sued by an attorney who is now calling me as a witness in a trial,” DiClaudio said. It could be perceived as an “appearance of impropriety,” he noted, if an attorney from a previous Krasner firm worked to negotiate reduced charges in a given case. Then, he cited the case of two U.S. Marines allegedly assaulted in Old City by three suspects who were held on (felony) aggravated assault charges. A trio of attorneys – Michael Coard, Thomas Ivory and Marni Jo Snyder – represent the suspects in that case. All three worked in various capacities to help get Krasner elected. None of those attorneys mentioned agreed to comment to PhillyVoice on Wednesday. The battle between judge and district attorney has people on edge throughout the legal community and specifically in the CJC. Specifically, there are worries about how it could impact people awaiting trial. Keir Bradford-Grey, chief defender in the Defender Association of Philadelphia, was in and around Courtroom 905 throughout the proceedings. Nino Tinari, a longtime defense attorney in Philadelphia, said he’s never heard any complaints about DiClaudio’s work on the bench. He said in court that “the defense bar” believes that he is a “fair-minded” judge. In the hallway outside, he said that he’s never seen anything like this happen in a Philadelphia courthouse. It is the largest group of West Bank housing units advanced since President Donald Trump took office in January 2017. The Trump administration is expected to roll out an Israel-Palestinian peace plan after the Israeli elections. Airbnb reversed its controversial ban on listings in Israeli West Bank settlements Tuesday night, ending a five-month dispute over the legality of the measure. 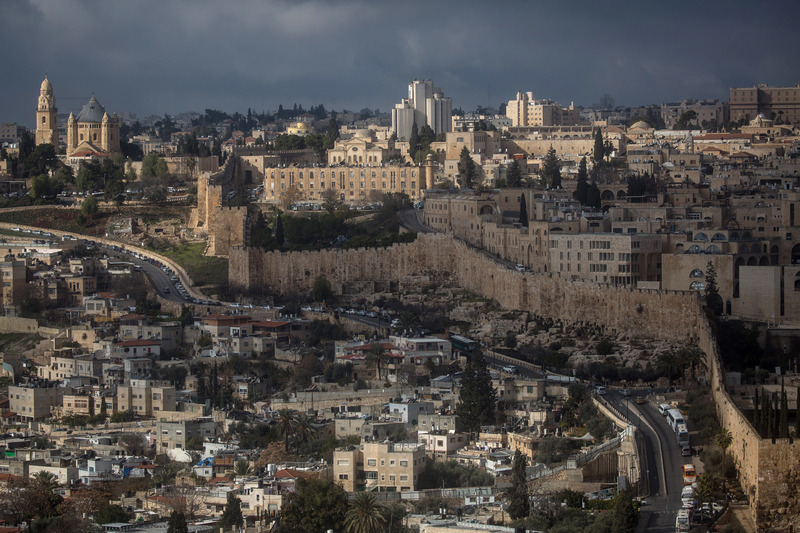 The reversal was mandated in part of a settlement with a pro-Israel law organization that sued the company over its West Bank ban. The lawsuit accused Airbnb of discriminating against listings posted by Jewish hosts. Airbnb announced it would also implement the non-profit donation model in other disputed territories around the world, in what seems to be an effort to avoid alignment in political hostilities. Such an end-goal is becoming increasingly challenging to achieve for Airbnb and similar international corporations. The Airbnb announcement came as Israeli voters were taking to the polls to elect their Prime Minister in the general election last night. 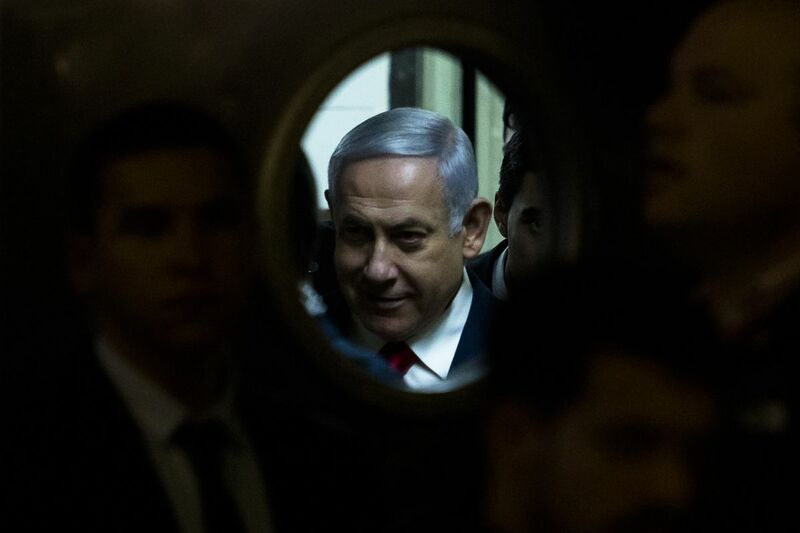 The Likud party’s coalition alliances look to have established a clear pathway for the continued tenure of incumbent Benjamin Netanyahu — who promised to annex Jewish West Bank settlements if reelected. 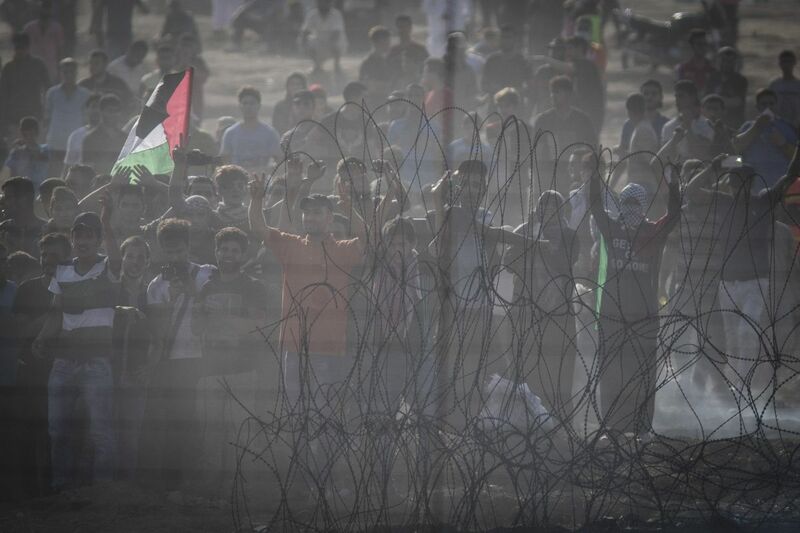 These two axes of authoritarianism — weakening Israel’s democratic institutions while perpetuating rule over the Palestinians without granting them political rights — are connected. The conflict with the Palestinians has destroyed Israel’s left and empowered a seemingly ever-more-radical right. In Netanyahu’s fifth term, this connection could become even more explicit: Experts on Israeli politics are concerned he might support a more concrete annexation plan as part of a Faustian bargain for the extreme right’s support in his quest for immunity from prosecution. If Netanyahu is still in office by the summer, which seems extremely likely, he will become the longest-serving prime minister in Israeli history — passing David Ben-Gurion, the first Israeli prime minister, who has often been referred to as Israel’s George Washington. But if Ben-Gurion is remembered as the midwife of Israeli democracy, Netanyahu could be remembered as its gravedigger. In Case 2000, Netanyahu allegedly attempted to strike a deal with the owner of Yedioth Ahronoth, Israel’s largest newspaper: He would pass a law limiting circulation of one of its rivals, the already pro-Netanyahu Israel Hayom, in exchange for more favorable coverage in the Netanyahu-skeptical Yedioth. The Saturday before the election, Netanyahu went on Israel’s Channel 12 to make the case for his election. He promised something astonishing: that he would annex Jewish settlements in the West Bank. If that comes to pass, it would be an utter catastrophe for Israeli democracy. The prime minister would simultaneously be dismantling checks on his power within its recognized borders and moving Israel towards apartheid outside of them. 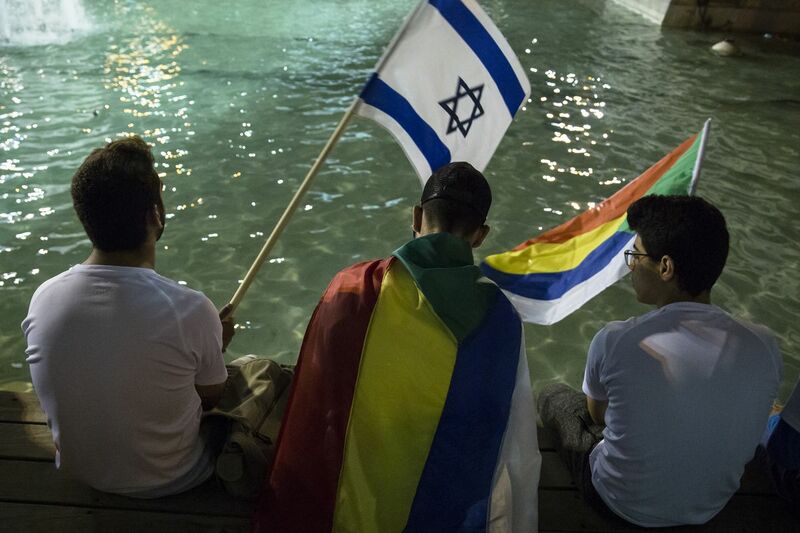 The world’s only Jewish democracy would be in mortal peril. February 12 2019, 8:00 a.m. Longtime Nutley High Athletic Director Joe Piro, who admitted Tuesday he was the guest speaker who described Adolf Hitler as a “good leader” during a presentation at Madison High, apologized for his remarks and said he was trying to make a point that badly missed the mark. Piro’s apology comes three days after he gave a presentation on leadership to student athletes at Madison High and used Hitler as an example of a “good leader” with “bad moral character and intentions.” During the presentation, Piro showed images of notable leaders, including a picture of Hitler shown side by side with Martin Luther King Jr.
Piro, 47, is one of the most prominent athletic officials in New Jersey and has been instrumental in shaping some of the state’s most important sports policies. Four years ago, he helped create the Super Football Conference, a 113-team league that spans seven counties and is considered a model for other leagues across the nation. Piro currently serves as SFC president. Some parents in attendance told NJ Advance Media they were not offended by Piro’s presentation and gave it little thought until they saw parents discussing it later on Facebook. “We believe in using this incident as an opportunity to highlight cultural responsiveness and sensitivity within our schools, curriculum and community,” she said. NUTLEY, N.J. – A New Jersey sports official who told student athletes Adolf Hitler was a “good leader” with “bad moral character and intentions” has been suspended. 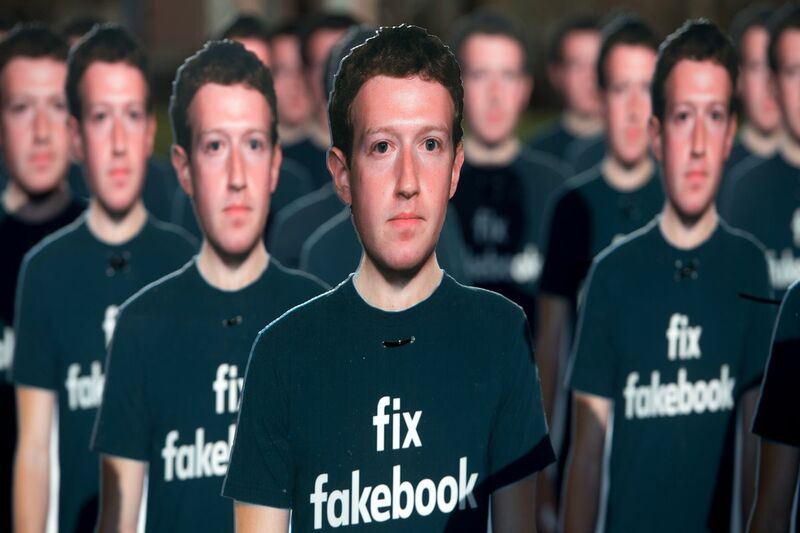 One hundred cardboard cutouts of Facebook founder and CEO Mark Zuckerberg stand outside the US Capitol in Washington, DC, in April 2018. The ban will focus on explicit language and will not target more implicit statements supporting white nationalism and separatism. While civil rights groups want Facebook to work harder to eliminate racism and bias on its platform, they say the new policy is a crucial first step. The ban comes less than two weeks after a mass shooting at two mosques in the New Zealand city of Christchurch, and after much criticism over Facebook’s previous policy. In a May 2018 investigation, Motherboard found that internal Facebook moderator training documents allowed explicit support for white nationalism and separatism, claiming that these ideologies are not always rooted in hate or racism and were different from support for white supremacy. Months later, Facebook says it agrees. “We decided that the overlap between white nationalism, [white] separatism, and white supremacy is so extensive we really can’t make a meaningful distinction between them,” Brian Fishman, policy director of counterterrorism at Facebook, told Motherboard. Facebook initially said white nationalism and white separatism were significantly different from white supremacy. Experts disagreed. Less than two years ago, a white supremacist rally in Charlottesville, Virginia, ended with the death of counterprotester Heather Heyer and injuries to other counterprotesters. In the weeks after the violence, Facebook began making external and internal changes to how it handled white supremacy on the platform. The changes included drawing the distinction between white supremacy, white nationalism, and white separatism. Historians and civil rights groups disagreed with the distinction, noting that the differences among the three ideologies are minimal, and that white nationalists and separatists often openly express a belief in white supremacy. “Anyone who distinguishes white nationalists from white supremacists does not have any understanding about the history of white supremacism and white nationalism, which is historically intertwined,” American University historian Ibram X. Kendi told Motherboard last year. “When we met with your company this summer, both our staff as well as the staff at Facebook, were unable to identify an example of white nationalism or white separatism that was not white supremacist,” the group said. They also pointed to specific Facebook pages with names like “It’s okay to be white” and “American White History Month 2” to further make the point that content considered to be white nationalist or separatist still often supports a belief in white supremacy. On Wednesday, the civil rights group said it supported Facebook’s decision, but it wants the platform to take additional action. “While we are pleased that Facebook is taking long overdue action, we know well that communities are still reeling from the rise in hate and racially motivated violence, and that extensive remedial action must be taken to ensure that hate is eliminated root and branch across the platform,” Kristen Clarke, the organization’s president and executive director, said in a statement. Other groups agreed. “We are glad to see the company’s leadership take this critical step forward in updating its policy on white nationalism,” Rashad Robinson, president of the online racial justice group Color of Change, said in a Wednesday statement. Last week, Facebook settled a group of civil rights lawsuits and complaints, promising that it would change its advertising tools to limit the ability of some groups to target people based on race, gender, age, and other categories. While cvil rights groups support these changes, they say that Facebook is really late to addressing these issues and must work to seriously enforce the ban it has finally put in place. Police have said a threat apparently made by a group calling itself Antifa Dundee against a far-right campaigner was not “credible”. 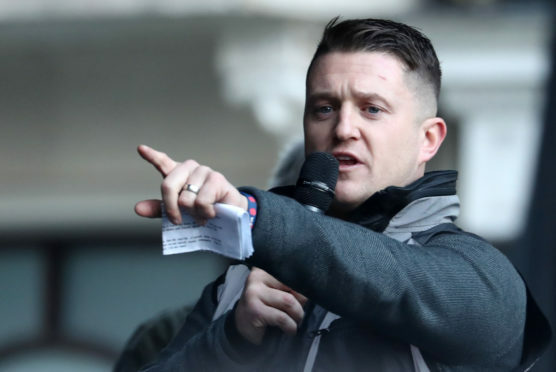 Tommy Robinson, whose real name is Stephen Christopher Yaxley-Lennon, posted a video on YouTube on Saturday in which he revealed police visited his Bedfordshire home to warn him of threats made by groups calling themselves “Antifa UK” and “Antifa Dundee”. The Antifa movement is a loose conglomeration of left-wing anti-fascist groups. The recording made covertly by founder of the English Defence League, Yaxley-Lennon in January captures a policeman telling him about the alleged threats from the two groups. Entitled “The British DEEP STATE and their persecution of TOMMY ROBINSON” it has been viewed nearly 150,000 times. The policeman is recorded saying: “It basically says they are planning to hurt or possibly kill Tommy Robinson because they know where he lives and want to silence him. “They got their hands on some AK-47s and petrol bombs. Allegedly, they’re going to put these petrol bombs through your door when he sleeps. “They also say they are planning to attack a few MPs”. A Bedfordshire Police spokeswoman said they could not comment on the issue as it was a live investigation. However, a Police Scotland spokesman said the Dundee connection had been investigated and no credible threat had been found. Police in the UK deliver what are known as Osman warnings whenever death threats are made against an individual. No one from Antifa Dundee responded to requests for comment. Robinson is one of the most controversial figures in British politics. He founded the far-right, Islamophobic English Defence League and led the organisation for four years between 2009 and 2013. He has been banned from social media sites including Facebook, Instagram and Twitter for breaking rules on hate speech. Facebook said he broke rules that ban public calls for violence against people with protected characteristics and those that ban supporting hate groups. Since November last year, Robinson had been adviser to UKIP leader Gerard Batten, prompting the party’s former leader Nigel Farage to describe him as a “thug”. Facebook, which already blocks white supremacy posts, announced a ban Wednesday on content supporting white nationalism or separatism. Starting next week, Facebook and Instagram will remove posts and comments that praise or support white nationalism. The social network said it hadn’t banned expressions of white nationalism because it was considering the broader scope of the concept, like separatism and pride. However, after conferring with race relations experts, Facebook decided that the rationale it applies to white supremacy also should apply to white nationalism, due to the company’s long-standing policy against hate speech on race, ethnicity or religion. Facebook said it will apply the same artificial intelligence detection it uses to identify terrorism content for white nationalist posts. Facebook also said it will connect people who make searches about white supremacy to organizations such as Life After Hate, which was founded by former violent extremists and provides education and support. Facebook’s announcement came less than two weeks after a self-proclaimed white nationalist killed 49 people at two mosques in New Zealand. The shooter streamed the attack live on Facebook, and copies of the video spread across Facebook, Twitter and YouTube. Following the attack, President Donald Trump said he did not see a rise in white nationalism. My, my, my… look what is happening to the leftist gem known as the Southern Poverty Law Center! After years of working side by side with the fake mainstream media, high ranking employees such as Morris “Dees The Sleaze” Morris and Richard “Gentiles Must Be Enslaved” Cohen are now resigning and being exposed as the crooks and thieves that they have always been. As they have collected hundreds and hundreds of millions of dollars, even using shady off-shore bank accounts, they have put out fake “hate group” statistics that the fake news was more than happy to reprint across all of their outlets. The information that the SPLC has put out is nothing more than exaggerated lies. They recently put out statements that there are over 1200+ “hate groups” in the United States, where are they? Where are all of these so-called evil groups and individuals? Sure, their fake numbers help them raise money to line their pockets, but there is no epidenic of “hate group” movements and the SPLC has been nothing but a money-making machine. And in case you didn’t know, the Southern Poverty Law Center has weaseled their way into working directly with companies such as Amazon, Ebay and Paypal to attack everything pro-White, even merchandise that isn’t remotely offensive in any way. Now, they are being shown as the real slime… and it’s hilarious to watch! In a statement, Cohen said the organization will “emerge stronger” after an audit of its practices by Tina Cohen, a Chicago-based attorney and former chief of staff for former first lady Michelle Obama. Cohen’s exit comes a week after SPLC co-founder Morris Dees was dismissed and some center staff raised concerns over whether the group’s mission of combating hate and discrimination conflicted with the treatment of its minority employees. 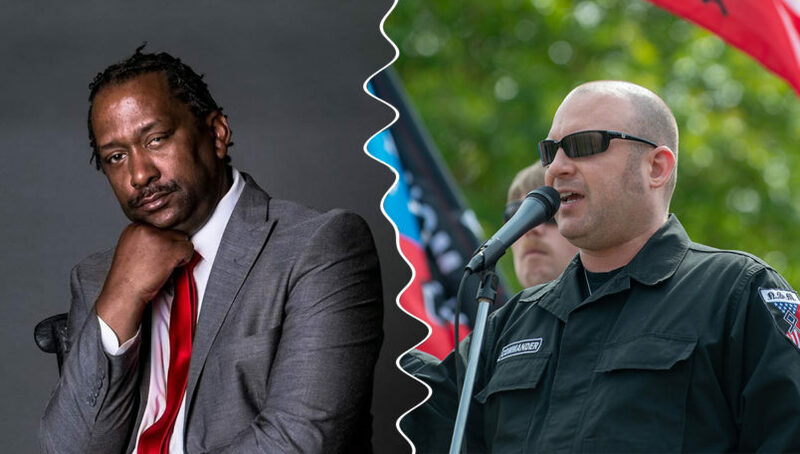 Each side is now accusing the other of fraud, with the former leadership of the National Socialist Movement (NSM) and California activist James Hart Stern each threatening legal action over control of the organization. In a Wednesday interview with TPM, recently retired NSM “commander” Jeff Schoep said that he was persuaded under false pretenses to formally turn the reins over to Stern. Schoep also released a statement saying Stern has “no legal control or legal standing with” the NSM. Stern told TPM he simply outsmarted the NSM, and that he’s filing a restraining order to halt Schoep from trying to interfere with a group he no longer controls. A spokesman for the department confirmed to TPM that “anyone” can file these documents, and that the state has no process for confirming that changes in corporate leadership are legitimate. But Stern told TPM that he has other proof that Schoep legally authorized him to assume control of the NSM, including recordings of phone conversations and a notarized affidavit. “This was not just a stunt,” it continues. The document (pictured below) contains multiple grammatical errors, additional words, and repeated misspellings of Schoep’s name. Stern said he plans to file a restraining order against Schoep for violating that agreement in Riverside County, California, where Stern lives, on Wednesday. This bizarre situation further complicates the legal battle that was already embroiling the NSM and led to Stern being named president of the group in the first place. The NSM and Schoep are among the many defendants named in a federal lawsuit brought on behalf of 11 Virginia residents injured during the violent white supremacist rally that erupted in Charlottesville in the summer of 2017. 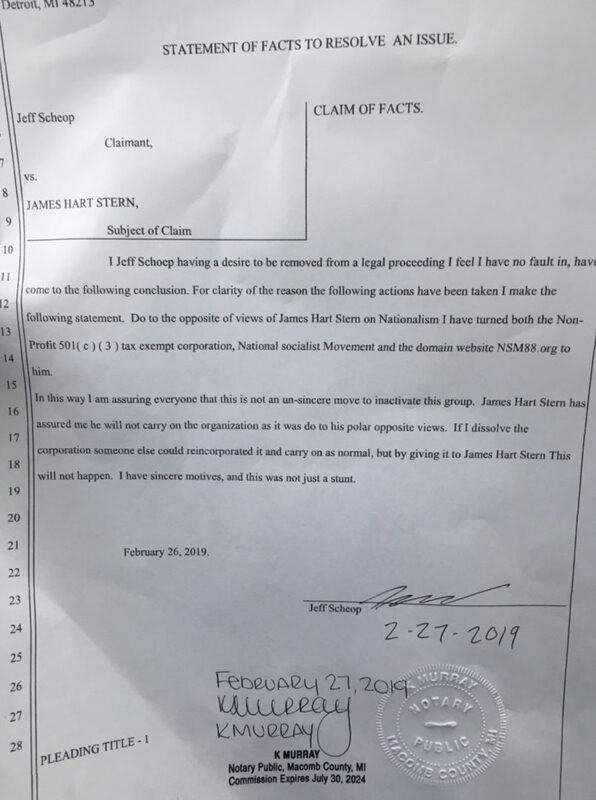 Stern managed to convince Schoep that having him assume control of the NSM would relieve the group of legal liability in that suit, both men agree. But exactly why and how this happened depends on who you ask. Stern and Schoep have almost opposite accounts of how this came to pass, as the men first told the Washington Post, though they agree they were acquaintances who were in regular contact over the past several years. That contact was rooted in Stern’s unlikely friendship with former Ku Klux Klan Grand Wizard Edgar Ray Killen. The pair were cellmates in a Mississippi prison while Stern was serving time for defrauding the Magnolia State’s licensed cosmetologists and Killen was serving a 60-year sentence for his role in orchestrating the infamous 1964 murders of three young civil rights workers, James Chaney, Andrew Goodman, and Michael Schwerner. Killen ended up signing over power of attorney to Stern, and Stern used that authority in 2016 to dissolve the KKK chapter that Killen once ran. Stern and Schoep each allege that the other made first contact around 2014 to discuss the unusual relationship that Stern had with Killen, and remained in touch in the following years. They even held a “race relations summit” in California attended by members of the NSM and black activists. Both men say that they would exchange semi-regular phone calls, in which Schoep divulged to Stern that he felt ready to move on from the neo-Nazi organization he’d run since 1994. In Stern’s telling, Schoep was exhausted by the Charlottesville suit and eager for the opportunity to leave the movement’s legal entanglements and interpersonal beefs behind. Stern said he offered to assume control of the NSM so that Schoep could do so. So he did. As the Southern Poverty Law Center first reported on Feb. 15, Schoep signed papers with the Michigan Department of Licensing naming Stern the leader of the organization. Schoep also fired the white nationalist-affiliated attorney, Jim Kolenich, who was representing himself and the NSM in that case. But he didn’t anticipate what happened next. Stern promptly filed a motion asking the judge in the Charlottesville case to find the NSM culpable of conspiring to commit violence at the “Unite the Right” rally. Judge Joel Hoppe said he could not take up the motion, noting that Stern was not an attorney and could not therefore claim to represent the NSM. Per a transcript of a March 1 telephone hearing provided to TPM, the judge ordered Stern to obtain representation for the group and Schoep to obtain representation for himself. He also indicated that he had no interest in allowing the NSM leadership struggle to delay the case, which is slated to go to trial in late 2019 or early 2020. As part of pre-trial discovery in the case, the judge ordered all the defendants to turn over their electronic devices and social media accounts for forensic imaging by Friday, March 8. In the meantime, Schoep and Stern have been bashing each other in the press, with Stern claiming he “outwitted” the ex-NSM leader and Schoep insisting he’d been hoodwinked. The lifelong neo-Nazi told TPM that Stern was “pure evil” for misleading him about his intentions for the case and the future of the group. Schoep said he planned to surface details of Stern’s eccentric background, which includes a history of filing seemingly frivolous lawsuits and at least one other prison stint. As the Jackson Free Press once reported, Stern, who also goes by the name Akeem Reinsfield, once filed a $61 million lawsuit against Revs. Jesse Jackson and Al Sharpton for criticizing the movie “Barbershop”; sued the California Department of Corrections for failing to use sterilized hair-cutting instruments; and sued a Mississippi county clerk for allegedly committing perjury in his criminal case. Stern said Schoep was just “upset” that he’d singlehandedly destroyed the organization that he’d led for decades. “It’s my job to dismantle this group,” Stern said of the NSM. James Hart Stern is the new leader of the National Socialist Movement, and his first move as president was to ask a Virginia judge to find the group guilty of conspiring to commit violence at the deadly Unite the Right rally in Charlottesville, Virginia, in 2017, allegations made in a lawsuit filed that year by a counterprotester against NSM and other white-nationalist groups. Stern’s control over the neo-Nazi group and his swift actions to self-incriminate it have confounded the NSM’s members and perplexed those who study hate groups, largely because he and the group’s former president, Jeff Schoep, have not spoken publicly since the formal paperwork was filed in mid-February. Stern, who spoke with The Washington Post on Friday, said he had been waiting for a court hearing on the lawsuit scheduled for that morning before sharing the full story – one that he said includes infiltration, persuasion and a hint of manipulation. For five years, the two men had fostered a strange kind of relationship, Stern said. And when Schoep came to Stern for legal advice over the lawsuit in January, the California activist said he “saw a crack in the armor” and pounced. Schoep wanted a way out of NSM, Stern said, because he felt underappreciated by his followers and left out of the mainstream white-nationalist movement that had swept the country in the wake of the 2016 presidential election. Schoep was concerned about the repercussions of the Charlottesville lawsuit and the legal bills he was shouldering, Stern said, and he confided in the California activist as he sought solutions. So Stern, seeing an opportunity, said he encouraged Schoep to get a fresh start – by handing over control of the Detroit-based organization and website to Stern. Now, he’s preparing for what comes next – and seeking guidance from Jewish leaders. Stern said he does not plan to dissolve the corporation because he doesn’t want Schoep’s followers, or others in the white-nationalist movement, to reincorporate it. His plans for the website are still evolving, but his primary goal is to offer it as a reclaimed space to Jewish organizations that could help him educate NSM’s followers on the history of the Holocaust. This isn’t the first time Stern has befriended a white supremacist so he could infiltrate a hate group. While serving prison time in Mississippi for mail fraud, Stern was cellmates with onetime Ku Klux Klan leader Edgar Ray Killen, who was convicted in the “Mississippi Burning” killings of three civil rights workers. Stern said Killen regularly called him a racial slur in the year and a half they shared a jail cell, but the two nevertheless formed a relationship. In 2012, after Stern was out of prison, Killen granted him power of attorney and ownership of 40 acres of land, Stern said. In 2016, Stern used his legal discretion to dissolve the Klan organization Killen once led and garnered media attention. Two years later, Killen died at age 92. It was that case that piqued Schoep’s interest in Stern, according to the activist. Stern said that in 2014 Schoep called him without notice and asked several questions about his relationship with Killen. The two later met in Beverly Hills for a small race summit and have maintained phone contact ever since. Stern said he was “blunt” with Schoep but that the man still “confided” in him about personal and professional strife. Schoep took control of NSM in 1994 and was responsible for growing its membership and brand as an organization of Holocaust deniers and Adolf Hitler acolytes. The group maintains a website that draws in millions of visitors from around the world, Stern said, and has organized public rallies where violence has broken out. Matthew Heimbach, a leading white-nationalist figure who briefly served as community outreach director of the organization last year, told the Associated Press that there has been conflict between NSM’s leaders, including Schoep, and its membership. Heimbach estimated the group had 40 dues-paying members last year. The biggest challenge the group has faced, the SPLC’s Hankes said, was being outshone by the more refined efforts of new alt-right leaders such as Richard Spencer. There was tension within the organization about the need for a shift to a less violent, less explicit brand of neo-Nazism, he said. Stern told The Post that he and Schoep discussed this infighting and that Schoep expressed a desire to leave NSM behind and start a new organization with less baggage. Though Schoep is not longer legally affiliated with NSM, he still faces the lawsuit because he is listed as a defendant in an individual capacity. Black activist James Hart Stern says he will work to undermine the National Socialist Movement, the group he now leads. This is an older article about Bart Alsbrook, someone who has owned “pro-White companies” for many years and who continues selling (mostly bootlegs) from his websites (such as isdrecords.com and ns88.com) even after being outed as law enforcement. Achille police chief Christopher Watson says he knew about Bart Alsbrook’s connections to white supremacist groups, but still hired him to be a reserve officer in the police department. “In the two years that I have known him, he has done nothing but contribute,” said Watson. Last August Alsbrook was named interim Police Chief in Colbert. He resigned a week later, after eventually admitting his past ties to neo Nazi organizations. We reported last year Alsbrook was the Texas coordinator of a Skinhead group called Blood & Honor, a group the Southern Poverty Law Center calls an international coalition of racist skinhead gangs.. When we found Bart Alsbrook’s name linked to ISD Records and NS-88 videos — two websites that sell media and memorabilia aimed at skinheads – he claimed identity theft after skinheads stole his wallet at a concert in the 1990s. Watson says Alsbrook wanted to leave the Skinhead groups he admitted he belonged to. “He was involved in some kind of group then, and wanted out and the only way he figured he could get out would be to move far away,” said Watson. “I do not want my name associated with any hate ideology end quote.” He told us via email. Watson says Alsbrook has talked to him about trying to amend his checkered past. “Everyone has a past, some of which they may not be proud of, of which he is not. He wishes he never had those connections,” said Watson. Watson says the Achille police department has zero tolerance for racism. As for the report the SPLC just released this week, it concedes there is an uptick in the number of black nationalist groups since 2017, but it downplays this fact by claiming those groups “have little or no impact on mainstream politics and no defenders in high office.” I must’ve just imagined noted-anti-Semite and frequent Democratic guest Louis Farrakhan. Amazingly enough, the report also claims the White House “has energized” black nationalist groups, suggesting there’s a direct correlation between their increased ranks and Trump’s rise to power, which is quite a thing to allege considering black nationalist groups have been on the rise since 2000. The report also has a section titled, “HATE GOES TO WASHINGTON: Meet the Members of Congress Who Traffic in Hate and Extremism.” It includes Sen. Marsha Blackburn, R-Tenn., and Mark Harris, R-N.C., for supporting the traditional definition of marriage that Barack Obama supported until a few years ago. In fact, the section on members of Congress includes only Republicans, which is interesting considering that Rep. Ilhan Omar, D-Minn., an actual out-and-proud anti-Semite, also went to Washington this year. The report takes aim at Vice President Mike Pence, Secretary of State Mike Pompeo, and U.S. national security adviser John Bolton. The SPLC report lists the Alliance Defending Freedom, the Family Research Council, and the Family Research Institute as anti-gay “hate groups.” No report that lumps these groups in the same category as the Westboro Baptist Church should ever be relied on by journalists. Hate groups are real. Hate crimes are serious. The SPLC is not. It exploits hate groups to raise money and further political interests unrelated to the problem of hate. Don’t fall for the SPLC’s lies. It’s all a big cause for concern for Christians because the SPLC has taken an anti-Christian slant in recent years, targeting mainstream groups just because they hold biblical views about sexuality and life. CBN News has reported extensively on the SPLC’s radical agenda to silence conservative Christian groups like D. James Kennedy Ministries and the Family Research Council.